Borderless, Hi-Def photos up to 13" x 19"
The Artisan 1430 takes photo printing to the next level of performance, delivering brilliant, Ultra Hi-Definition prints as large as 13" x 19". And, with convenient wireless networking, it’s easy to share your Artisan 1430 with others. Now, anyone on your network can create large-size, gallery-worthy prints, or even design and print professional looking CDs/DVDs. The Artisan 1430 includes advanced color and lighting correction for amazing photos, as well as Adobe Photoshop Elements (a $79 value) for added creativity. Photos are smudge, scratch, water and fade resistant thanks to Claria Hi-Definition Ink. 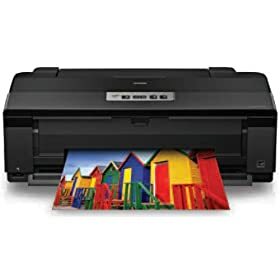 And, prints last up to four times longer than photo lab prints. 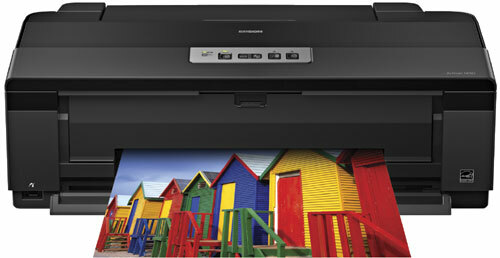 Take your creativity further with the Artisan 1430 — from Epson, the brand of choice among professional photographers. In popular sizes, including 4" x 6", 5" x 7", 8" x 10", 8.5" x 11", 11" x 14", 12" x 12" and 13" x 19"
ISO ppm is based on the international standard for measuring print speed. Black and color print speeds are determined in default, single-side mode in accordance with ISO/IEC 24734. Actual print times will vary based on system configuration, software, and page complexity. See www.epson.com/printspeed for details, including complete ISO reports. Packaging Specifications (W x D x H) — Dimensions: Printing 24.3" x 31.4" x 16.3", Storage 24.3" x 12.7" x 8.5" and Weight 26 lb.